A bus packed with Long Island high school students slammed in a bridge overpass on the Southern State Parkway, injuring dozens. Greg Cergol reports. 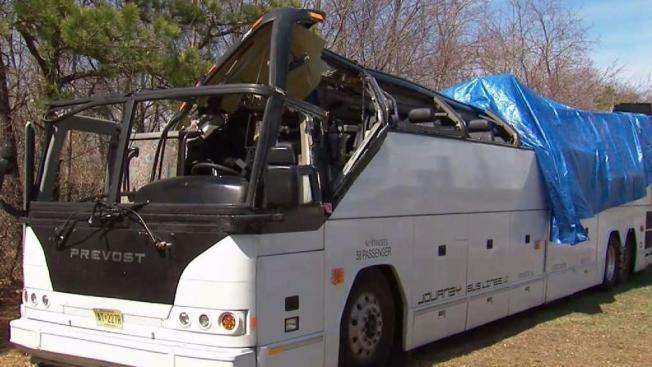 A charter bus carrying dozens of New York high school students returning from a spring break trip in Europe struck a bridge overpass on Long Island, seriously injuring several passengers and mangling the entire length of the top of the bus. The crash happened shortly after 9 p.m. Sunday on the Southern State Parkway in Lakeview, according to New York State Police. The eastbound lanes between exits 17 and 19 were closed for hours as authorities investigated. All 44 people, including the driver, on board the bus when it crashed were injured and taken to local hospitals, police said. Two 17-year-old girls who suffered serious injuries remain hospitalized. Five more people suffered moderate injuries and the rest suffered minor injuries, but all have been released from hospitals, state police said Monday afternoon. "There was glass everywhere," Lakeview Fire Department Chief Patrick McNeill told Newsday. "The roof of the bus is down to the top of the seat covers." Video shows teenagers sitting and standing outside of the white damaged bus, some draped in blankets, as firefighters inspect the wreckage. Multiple ambulances and fire trucks responded to the scene. The 38 students, ranging from 16 to 18 years old, from various Long Island high schools, along with five chaperones, had just returned from John F. Kennedy International Airport and were heading to a shopping mall in Huntington Station to meet up with parents at the time of the crash, police said. Police said the 43-year-old driver, who is from Bethlehem, Pennsylvania, had a valid Pennsylvania commercial driver's license and cooperated with investigators on scene. He registered a .00 percent blood alcohol content, and voluntarily provided a blood sample for a drug test, the results of which are pending. State police said he was using a non-commercial vehicle GPS device, and his planned GPS route was via the Belt and Southern State parkways, though police were still working to verify the actual route he took through forensic analysis and passenger interviews. "Someone -- either him or the chaperone -- said, 'Duck!'" said Maj. David Candelaria. "He didn't know it was gonna happen. He did show tremendous remorse, and he's very upset over this accident." Generally, vehicles with commercial plates cannot travel on parkways, state police say, though there's some leniency for some local mini buses contracted through DOT and state parks. Candelarias said the driver isn't from the area, and "doesn't know the Southern State Parkway from the L.I.E. to the Cross Island." South Nassau Communities Hospital -- a designated area trauma center that received some of the patients in the crash -- was notified of a mass casualty incident around 9 p.m. Sunday and prepared for patients from the scene. Chief of Emergency Service Dr. Joshua Kugler says the hospital saw mostly blunt force pattern injury, where "patients received injury patterns not necessarily from direct force but from blunt force throughout their body." "It had to do with the type of accident that took place, which was a shearing force on a large tour bus... as you can imagine, blunt force injury can do a lot of damage to the body," including organs and bones, Kugler said. Evidence of those injuries can also take some time to manifest, which is why the hospital has admitted two of the five patients it initially received. He added that he was surprised there was no fatality in the crash: "People, if they were standing on the bus at any particular time at the incident when it occurred, and someone became an airborne projectile, that could have had a very different outcome than we saw last night." The minimum clearance on the parkway is 7 feet, 10 inches and accidents involving vehicles striking overpasses are not uncommon on the parkway. In 2017, there were reports that an electronic alarm system would be installed on the parkway to warn drivers of vehicles too high for the overpass. NBC 4 New York reached out to the New Jersey-based bus company, Journey Bus Line, for comment, but calls were unsuccessful. The trip was organized by a private tour company, EF Tours, according to police. In a statement Monday, EF Educational Tours said, "All of us are shocked and saddened by the serious bus accident that occurred on Southern State Parkway in New York last night; our thoughts are with those who were injured." "We are doing everything we can to support the students, chaperones, and their families. We are also working with public safety officials as they conduct their investigation," the statement continued. "The safety of our travelers is always our top priority, and we are conducting our own review in parallel." The investigation into the wreck is ongoing.